I’m so excited about my first Small Home Style post for 2017! As a quick reminder to all my new faces around here, every Monday I’m sharing design ideas for small homes. I started the series last year to celebrate small homes. As a small home dweller myself, I have a soft spot for sharing creative ways fellow #SmallHomeDwellers can maximize their small spaces and give them style. Adding artwork in small space is a must, I personally love the look of over-sized artwork in a small room, especially a living room. Think of extra large artwork as the perfect punctuation in a room. In my own living room, I have a large canvas above my sofa, that packs a pretty punch of color in my room. 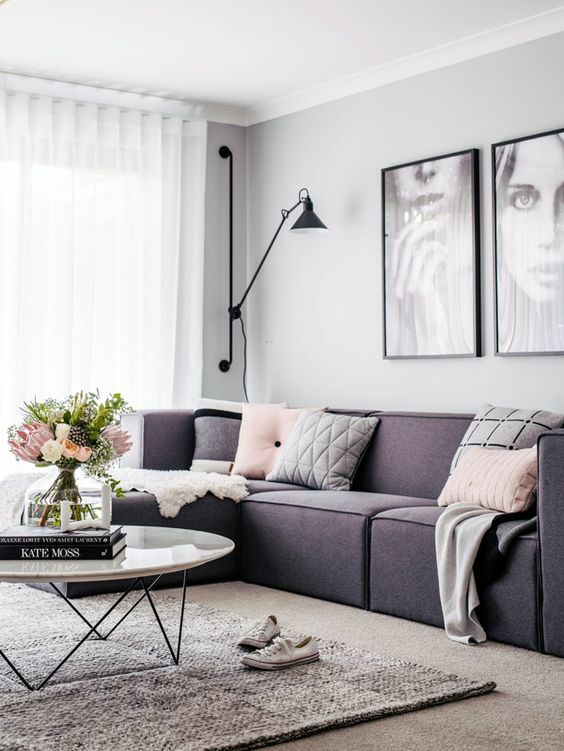 Gallery walls are so pretty and while I love the look of them in a living room, they can be tricky when it comes to small living rooms. The placement and size of each frame has to be well thought out, otherwise the look can come off as busy and just feel off. Instead of having 20 postage size pieces of artwork on a wall, consider going big with large statement artwork. I love either one large piece of artwork (canvas or framed) or two large scale prints side by side. Large artwork in a small space helps draw the eye up and out making the room height and width appear larger. Today, I’m sharing Three Go Big Artwork Ideas that will add impact in a small living room. ONE Abstract Artwork. I love abstract art and honestly it gets prettier and more interesting on a large scale. Colorful or Subdued abstract work in a room is a pretty and calming in a living room. The two large abstract artwork paired side by side, bring so much interest and warmth in the space. TWO Graphic Art, thank big bold black and white artwork or a bold black and white photo. Big graphic artwork adds that 'wow' moment in a room. THREE Beach / Ocean artwork is so soothing in a living room. The pretty colors of the ocean or a beach scene go perfectly with all most any shade and pillow combinations in a living room. I hope you enjoyed my Three Ideas for Adding Big Artwork in a small living room. Are you also a fan of big artwork in small spaces?